One piece of equipment that is often overlooked is the strainer. Here we will dive into the importance of the strainer, or, as it is sometimes referred more simply, filters or screens. No matter what you call it, strainers are very important to reduce clogging, excessive erosion of spray tips and consistent fluid circulation of your sprayer equipment. 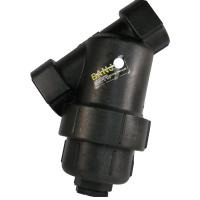 As the name alludes, this part strains or filters debris to ensure even uninterrupted flow.